Jared Leto's performance of a badly written trans woman character was not the groundbreaking, outstanding, skillful acting which so many mainstream critics have lauded. It was Leto doing his job. Since when do we hand out awards for people just doing their jobs? Leto could have taken the written character and through his skill as actor brought her to life as a real trans woman. He didn't. In response to my Snap Judgement, a number of people have brought up J. Bryan Lowder's article on Slate. My big problem with the Slate piece is it doesn't address what Prodigal addressed in her piece, although I am even more critical than she is. Leto could have taken the character as written and actually done something with that character so Rayon would be a real trans woman, instead of a collection of tropes. I don't feel he did that. The trans community has been so vocal because we don't feel that he did that. Rewatching Dallas Buyers' Club means going point by point on where I feel the characterisation falters and where I see Leto specifically miss chances at portraying a real person instead of a caricature. Leto doesn't really get much of a chance to portray Rayon's daily life until the movie is already pretty deep into the plot. And truth be told, she really isn't even in it that much. At about an hour into the movie, Matthew McConaughey's character Ron Woodruff introduces Rayon to a former friend of his. Woodruff misgenders Rayon, who shows no reaction. When the former friend refuses to take Rayon's hand, she lightly blows him off. This is an example of a missed opportunity. The look on Leto's face as he portrays this invalidating situation is... Well. Blank. Very blank. I (and other trans women critics of Leto's performance) can understand the desire on the part of a trans woman to pretend she is not bothered by this, but none of us can deny that the struggle would probably show, if only minutely in our faces. No such nuance is to be found. The scene continues with Woodruff misgendering Rayon again, and then we can see some notice of embarrassment that Woodruff is making a scene by trying to force his former friend to shake Rayon's hand... Yet still nothing that I recognise as a dysphoric reaction. Once the interaction is over, we finally do see a facial expression... One of gratitude and awe that Woodruff has changed so much from his homophobic start at the beginning of the film. And it comes off forced. The other role Leto has to portray in Rayon is that of the addict. This is an experience I can't speak to, although too many trans women can. My lack of personal experience aside, I did not find Leto's portrayal of Rayon compelling during the scenes where she was high, but they were very short scenes. They were also practically the only scenes she was in for the second half of the movie. If Leto did "deserve" any kind of award, it is only for doing exactly the minimum required of him in the role. Do we give awards for that? Are we now giving Oscars away for simply meeting minimums (actually, yeah, we are, and we have been for a while, but that's another issue entirely)? And is "meeting a minimum" really all we should expect in order to honor an actor charged with portraying members of an oppressed minority? One almost always portrayed through cisgender lenses and played up for fear or for laughs? I think not. I also don't much like the way that Lowder tries to speak on behalf of the entire queer community, and specifically, that he seems to try to speak on behalf of trans women and how we should feel about a portrayal of a trans woman. It's almost like he's admonishing us for being upset that Rayon is a mess when the issue is not that there aren't trans people who are total messes, but that Rayon is a mess because she is a caricature cobbled together from various cis-lensed trans tropes. From her affected voice, to the way she walks, to the traits that seem more of mix of different drag tropes than real personalities of trans women, Rayon is a plot device. She is written as such, and her place within the narrative does not exceed these boundaries. Leto himself could have done a great amount with tone, body language, and facial expressions through the film, especially during the scenes which dealt with addiction. He did not. Rayon was badly written, but Leto was handed that badly written character and took her nowhere. His acting was not exceptional, it was literally just what he was asked to do and no more. Leto's behavior since, and his comments and reactions to criticism, is just icing on the cake. His lame attempt to shoehorn in a nod to the trans community with some vague last minute comment about the Oscar being for anyone who was different... Well, that was assorted sprinkles. In different hands, maybe Rayon could have come across as a real trans woman. A mess of a trans woman, but life is messy. And messy lived experiences are valid lived experiences. That would have been an amazing performance to see, and it would have been worthy of the praise of the trans community even if the actor/actress was cisgender. It would have been an Oscar worthy performance. 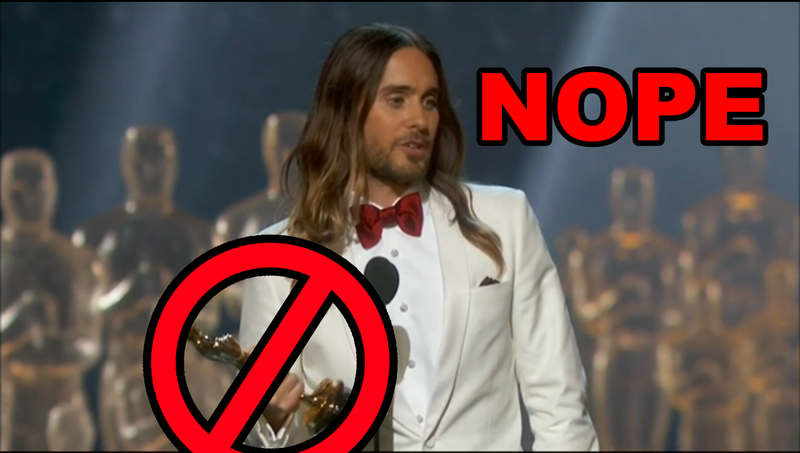 Leto did not deliver that performance.